Maria Moodie recently graduated from the University of Ulster Belfast. Marie’s work is fun, tactile, vibrant jewellery with a hint of comfort. 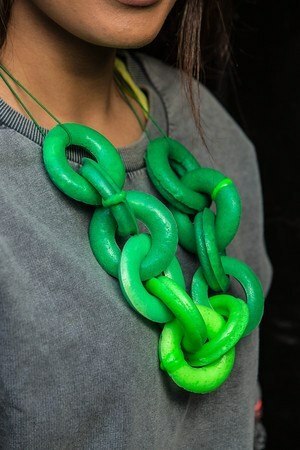 Made from a variety of sponge like foams and fluorescent powders, that have been moulded into oversized chains and beaded necklaces, to create a playful twist on classic designs. Interaction is an important element in discovering the tangible qualities within each piece, whether that be wearing, holding, or squeezing. The cheerful colours provide a light heartedness and combined with the smooth textures, entice the viewer to approach. The exuberant energy channelled through these soft materials allows the wearer to feel connected simply through the sense of touch.